← Charcoal, is there a technique? 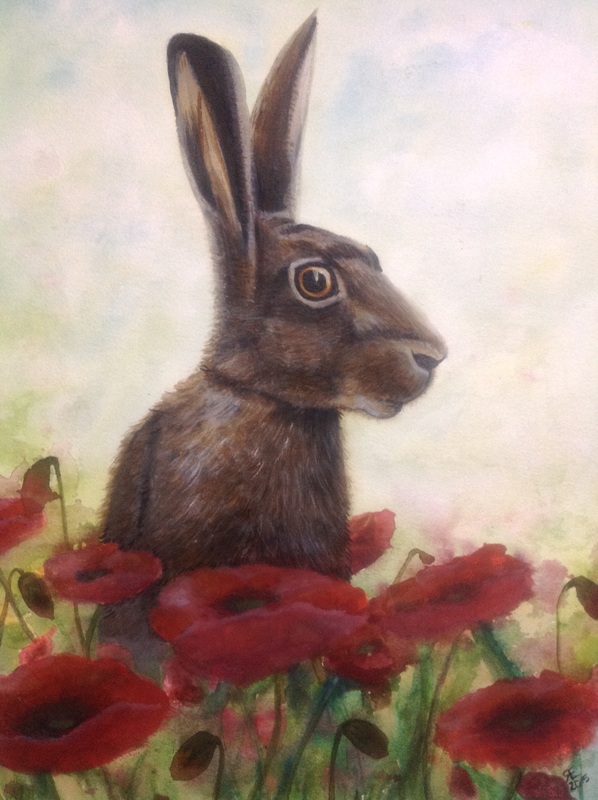 As I mentioned in my previous blog post, a friend of mine had asked if I could paint a hare with poppies, as a gift for a family member. Now I don’t usually paint flowers, so I thought having little experience of them I should avoid the realistic look, but rather a gesture of the poppy. I started the first picture in watercolour only, but straight off I was not happy with the poppies, then to further my distaste of the picture I felt the hare itself in the reference photo I had, was too square in the nose, and thin in the body, grrrr, I decided to begin a second painting, changing the poppies, and the hare. 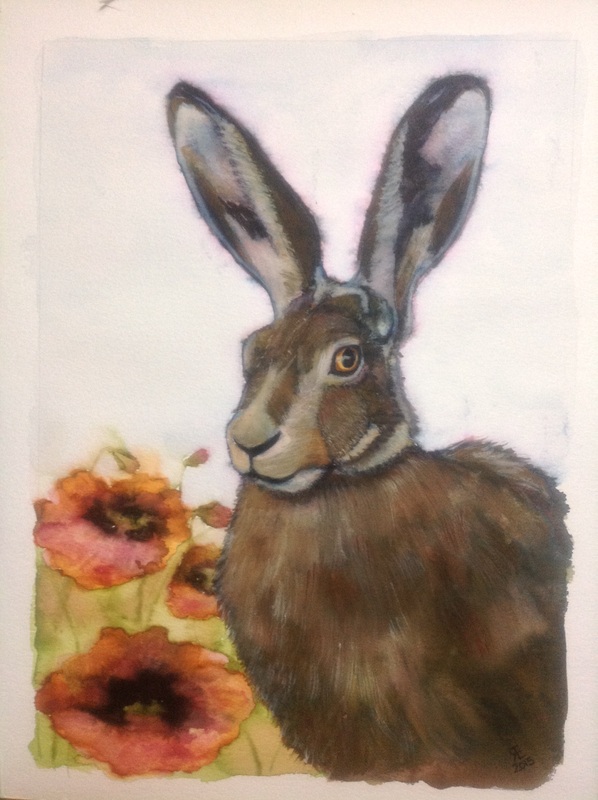 ( not wanting to waste the first painting I have continued to the end, using caran dache neocolor 2, I am really quite happy now with the end result, however still not keen on the hare shape). Painting two, is a different hare reference, and a different poppy. I think this is my fav, but they are all quite different, and my friend now has a choice! This one is painted only with watercolour, and I had used the elegant writer. As if a choice of two wasn’t enough, I ended up creating three. Painting three really started off as having a play with paints, then I created a muddy mess of colours, as I went overboard sprit zing the colours with water. Not to be disheartened and wasteful I set about changing my mess into something, so hare and poppies three was born. Due to my muddy mess of paint, I thought it wise to use the caran dache neocolor 2 pastels to cover my mess. It is not brilliant, but it was better than binning the card, and it is a different look to the other two paintings. which will she choose? I know which is my fav, who can tell as we all like something different. Please vote for your favourite – just for fun,see top of blog post. The results will not be used for anything, other than I think it is an interesting tool in seeing what people like. 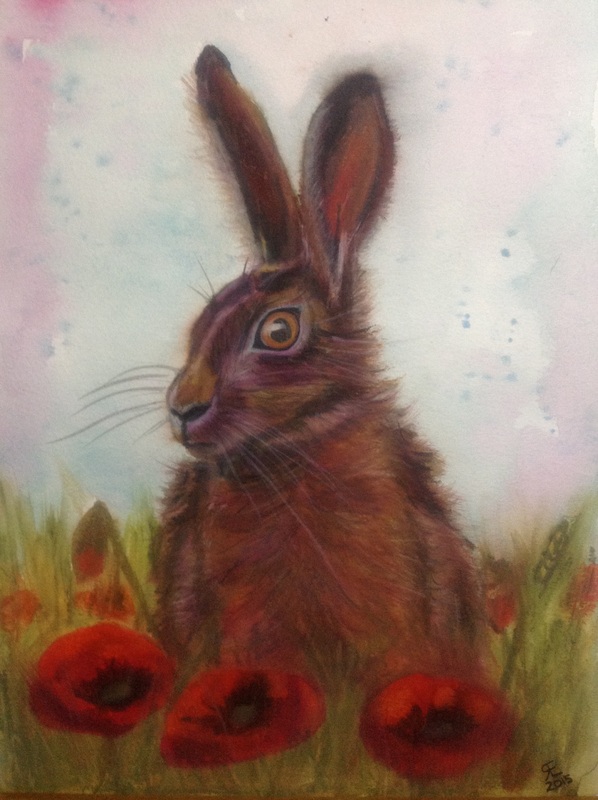 This entry was posted in art, caran dache neocolor, commision, Elegant writer, Hare, poppies, poppy, watercolour and tagged art, caran dache neocolor, commision, Elegant writer, Hare, painting, Painting, poppies, poppy, watercolour. Bookmark the permalink. Second one is my favorite also, but they are all very expressive and good. Thanks Laura, second one is my fave too….. I should have started a poll! I don’t know if WordPress allow tick boxes? Still new to this and finding my way round the blogging world, it would be interesting to see which is the favourite hare though.